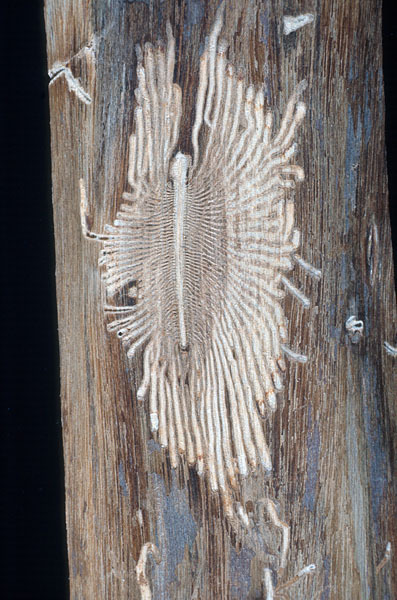 A disease management program for elms must include monitoring of the bark beetle population. Sticky traps baited with an appropriate attractant can be placed on buildings or structures such as telephone poles. In addition to reducing bark beetle numbers, these traps provide a means of evaluating population size. 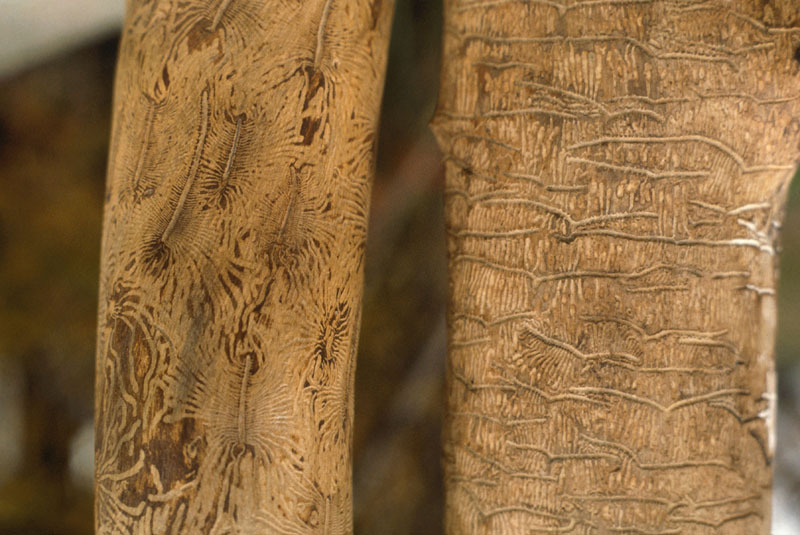 The biology of the smaller European elm bark beetle [Scolytus multistriatus (Marsham)] differs slightly from that of the native elm bark beetle [Hylurgopinus rufipes (Eichhoff)]. Control measures for the two species differ as well. Both beetle species can vector the two causal fungus species Ophiostoma ulmi and O. novo-ulmi. European bark beetles are more aggressive than the native ones. Reducing the bark beetle population is the best protection against outbreaks of Dutch elm disease (French et al. 1980). 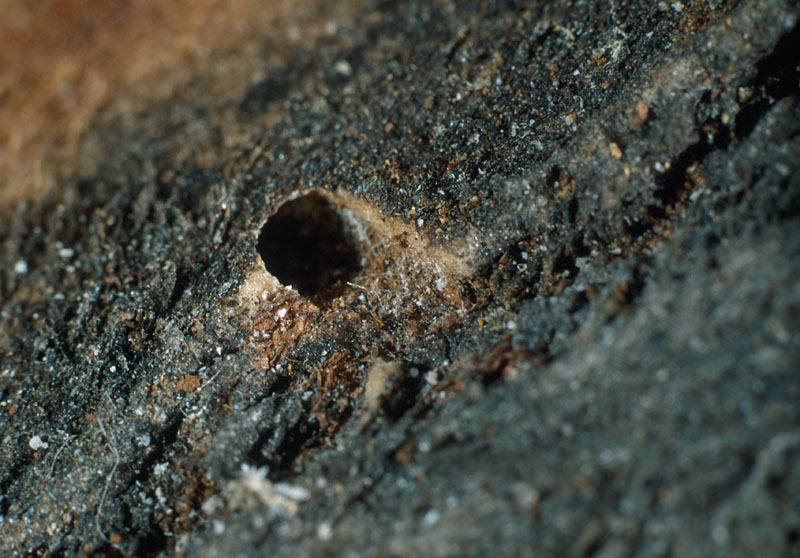 It is important keep bark beetles from completing their reproductive cycle. Diseased trees should be cut down and destroyed to reduce beetle numbers and keep the insects from carrying spores of Ophiostoma to healthy trees. Similarly, all dead and dying trees and all wood and bark that could be used as breeding sites should be destroyed. If smaller European elm bark beetles are present, pruning of elms should be carried out in late fall and in winter when bark beetle activity is reduced or absent (Byers et al. 1980). Grinding of stumps is also recommended. Wilted branches on all elms (Thibault 1993) should be pruned and destroyed to eliminate potential bark beetle breeding sites. Felled trees kept for firewood should be debarked and the waste wood burned or buried. Pesticide applications can be made to kill bark beetles. Over the years, various insecticides have been used. When the native elm bark beetle is targeted, the spray is applied to the base of the tree (4 m) in early fall (before mid-September). This will keep bark beetles from emerging from trees in late winter in search of feeding sites. 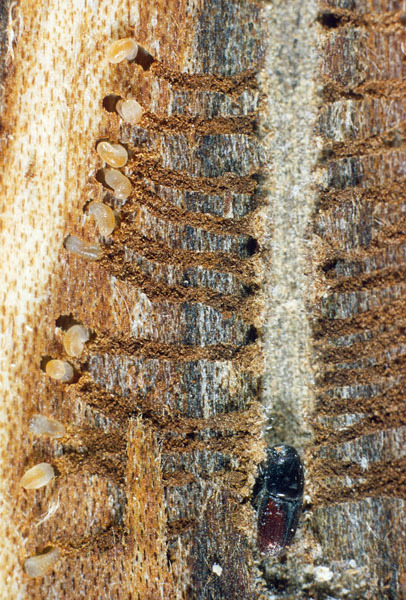 Chemical control of the smaller European elm bark beetle is also possible but it involves spraying the entire crown. Since this would create significant chemical losses detrimental to the environment, this measure is not warranted. Furthermore, the adult stage of S. multistriatus does not overwinter at the base of the trunk (French et al. 1980). 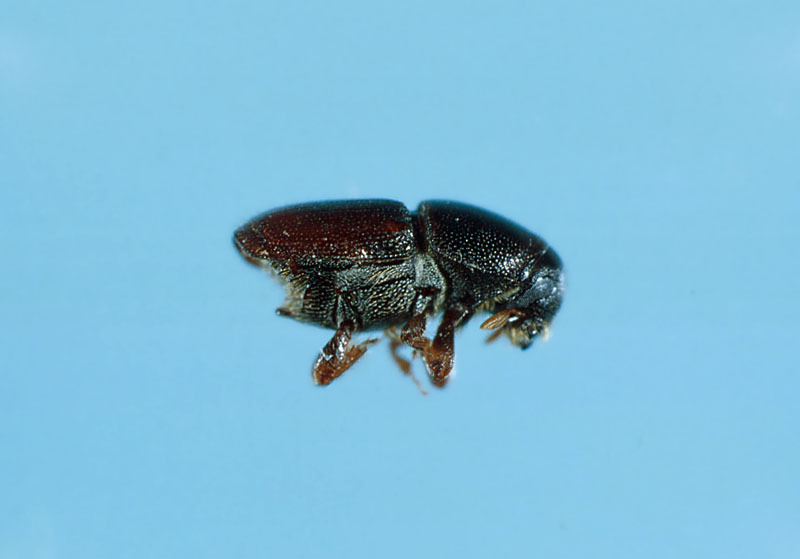 Insecticides registered for use in Canada against the smaller European bark beetle contain chlorpyrifos as active ingredient. 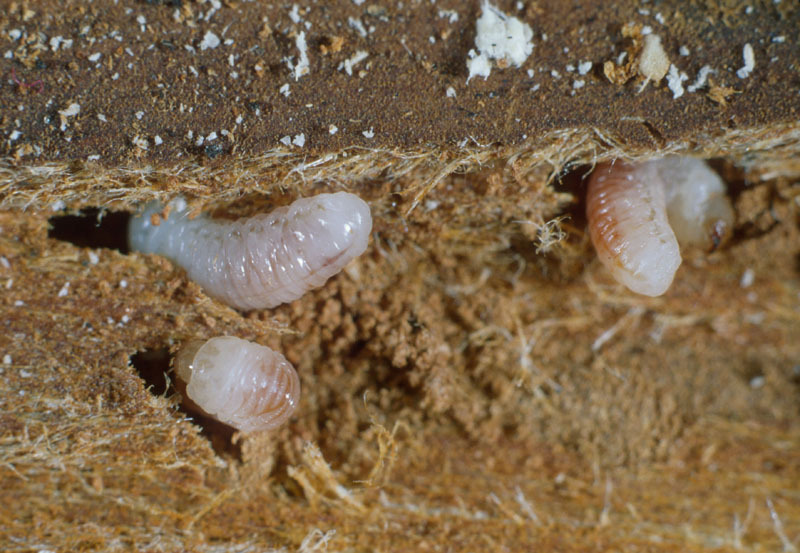 There are two primary methods of biological control for bark beetles, but both of them are still in the testing stage. The first approach involves the application of spore suspensions of Bacillus thuringiensis (Jassim et al. 1990a), a bacterium well known for its efficacy against the spruce budworm. This bacterium (called Bt) produces peptide-based crystals that are toxic to most lepidopterans, coleopterans and dipterans. Little research has been done in this area, but it appears that bark beetle larvae are susceptible to B. thuringiensis (Jassim et al. 1990a). Although the mechanisms of its pathogenicity have not been fully elucidated, Bt is considered to hold promise as a biological control agent. A second avenue consists in the use of parasites from the Hymenoptera family, which can develop within bark beetle larvae and kill them (Jassim et al. 1990b; Manojlovic et al. 2003; Manojlovic et al. 2000). Nonetheless, harnessing hymenopterans to parasitize larvae of S. multistriatus may be a challenge, since this beetle breeds in the part of the elm tree with the thickest bark (Manojlovic et al. 2000). Monitor populations of smaller European elm bark beetles in elm stands and quickly identify early symptoms of Dutch elm disease in trees. Assess the population density of bark beetles. Cut down dead, dying and very weak trees. Sanitation: preventive pruning of elms in fall and winter. Reduce the population of insect vectors by using traps or insecticides. Continue to monitor the elms during periods when disease incidence is low. Conduct research on methods of controlling and eradicating the disease. Byers, J.A., Svihra, P. and Koehler, C.S. 1980. Attraction of elma bark beetles to cut limbs on elm. J. Arboric. 6: 245-246. French, D.W., Ascerno, M.E. and Stienstra, W.C. , 1980. The Dutch elm disease. Minnesota extension service, University of Minnesota. AG-BU-0518 p.8. Jassim, H.K., Foster, H.A., and Fairhurst, C.P. 1990a. Biological Control of Dutch Elm Disease Bacillus-Thuringiensis as a Potential Control Agent for Scolytus Scolytus and Scolytus Multistriatus. Journal of Applied Bacteriology 69(4): 563-568. Jassim, H.K., Foster, H.A., and Fairhurst, C.P. 1990b. Biological Control of Dutch Elm Disease Larvicidal Activity of Trichoderma-Harzianum Trichoderma-Polysporum and Scytalidium-Lignicola in Scolytus-Scolytus and Scolytus-Multistriatus Reared in Artificial Culture. Annals of Applied Biology 117(1): 187-196. Lanier, G.N., and Jones, A.H. 1985. Trap Trees for Elm Bark Beetles Scolytus-Multistriatus Augmentation with Pheromone Baits and Chlorpyrifos. Journal of Chemical Ecology 11(1): 11-20. Lanier, G.N., Schubert, D.C., and Manion, P.D. 1988. Dutch elm disease and elm yellows in central New York. Plant disease 72(3): 189-194. Manojlovic, B., Zabel, A., Peric, P., Stankovic, S., Rajkovic, S., and Kostic, M. 2003. Dendrosoter protuberans (Hymenoptera: Braconidae), an important elm bark beetle parasitoid. Biocontrol Science and Technology 13(4): 429-439. Manojlovic, B., Zabel, A., Stankovic, S., and Kostic, M. 2000. Ecphylus silesiacus (Ratz.) (Hymenoptera, Braconidae), an important elm bark beetle parasitoid. Agricultural and Forest Entomology 2(1): 63-67. Thibault, M. 1993. Guide du soin des arbres pour horticulteurs et arboriculteurs amateurs. Éditions du Trécarré, Québec, pp. 107-113.